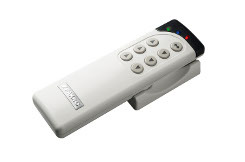 The ZWPS3 remote control is an older version of the controller designed to operate ARZ Solar roller shutters. The remote control can be used to operate three roller shutters individually or three roller shutters simultaneously. The ZWPS3 remote control allows to check the battery charge level. Moreover, it enables remote control of electrical devices compatible with the Z-Wave system. Also, for convenience the device can be magnetically wall mounted. The ZWPS3 remote control enables radio control of FAKRO accessories and of other manufacturers which are compatible with the Z-Wave communication system. The ZWPS3 remote control is equipped with a two-way Z-Wave communication radio module which exploits radio wave frequency 868,42 MHz EU (frequency depending on the country for which the product is intended).